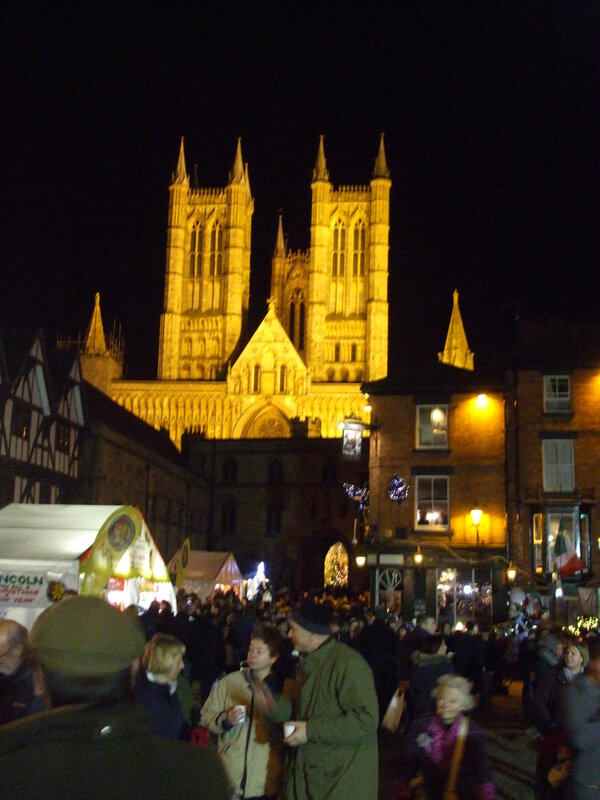 Over the last weekend, the annual Christmas Market was held in Lincoln. As always, stalls stretched across a section of ‘uphill’ part of the city known as the cultural area – i.e. where the castle and cathedral are. This area is, literally, ‘uphill’. Lincoln is a strangely shaped city: parts of it are at the top of the hill and some stretches out at the bottom. The slope in betweeen the two is quite steep, though it is built on, of course, and the main, narrow road leading from the main shopping area of lower Lincoln to the top of the hill is aptly called, Steep Hill. The majority of stalls were inside the castle grounds, many the traditional chalet style, others beneath a number of marquees. There were many goods on offer, on stalls from several European countries as well as different areas of Britain. German stalls were prevalent, as to be expected due to the ‘twinning’. Many of them sold food and drinks of one type or another, both hot and cold. Here are a few of the dozens of photos we took around the market and castle grounds. Many were just too ‘glary’ due to the bright lights. 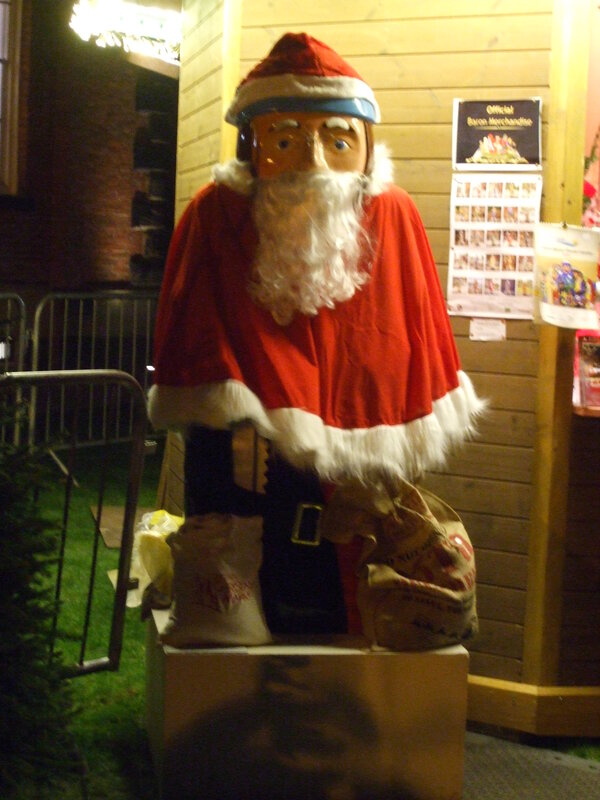 Well, that’s it for this year about the Lincoln Christmas Market. Now I need to think of a post about all the ‘mini barons’ that are hidden around the city. We’ve managed to find quite a few. Aw Millie! It looks lovely! I’m so glad you shared your experience 🙂 it’s a shame we couldn’t go but I’m sure we’ll catch a different one! Yes, it’s a shame, but understandable. I was hoping you’d get there, then we could have said hello. I do understand why you couldn’t make it though. We had many years when we first married in just the same situation. The market at York is on all December. It’s not as atmospheric as Lincoln, but it’s got plenty of stalls. I don’t know whether Hull has one. Have a hunt online. They are fun! Yeah, exactly! Throw it all into one giant extravaganza! 🙂 I think that’s a brilliant way to go about it – it gets busier, but I can imagine it has much more of a buzz of excitement around it, knowing it’s short lived. Enjoy Nottingham! I’d have to ask Kieran that. He knows everything there is to know about trains and what’s going on where! Lol. He’s obsessed with them! I still have a post to write up about our last visit, but it will be after Christmas now. Looks like such a lovely experience, Millie!! I really enjoyed this, Millie! Looks like a fun experience! The hand carved airplanes look fabulous! Thank you! There are a lot of stalls displaying hand-crafted good. The German and Scandinavian items are really beautiful. We’ve bought a few handmade clocks over the years. There are always some great new stalls to find each year. The sound of handmade clocks is always wonderful. Too bad you don’t see it enough or appreciated enough! I think many of those old crafts are dying out, unfortunately, and keep going mainly for the tourist trade. People much prefer hi-tech gadgets nowadays. Both have their place, of course. I love wood, the look and the feel of it. Wood carving is an amazing art. wood art is beautiful but you are right. Technology has it’s place. I wish I could attend this event! wow love the pictures and glad you took pictures both last year and this year. It would be so lovely in the evening. Sounds like you would get your exercise going up the hill! Love the stalls and crafts! Looks amazing so many beautiful pictures! Thanks for sharing with us! It looks lovely, you must have had a great time. I love Christmas markets, they get us into that lovely Christmas feeling. I went to Winter Wonderland in London many times, but l am not sure if we are going this year, it is way too packed, not an ideal place to go with a baby. I know how difficult it is to get about with a baby. I’ve done it six time over! I’d like to go to Winter Wonderland, too, but it won’t be this year. I think many of us like these festive events. They mean so much at this time of year. Thank you Daniela. Lovely post Millie…feeling very festive now! Beautiful! Thanks for sharing and allowing me to visit this interesting event. May this holiday season make things better for you. As they say: “This, too, shall pass.” Hugs. I know, Jack. I’m still brooding on her words and wondering whether she was right. Things like that do make you doubt yourself. I just have to try not to be so sensitive, but I’m a bit too old to change my temperament now. 🙂 I know it will pass, but right now, it still smarts. Thank you for your friendship and advice. It’s so much appreciated. I really enjoyed the Lincoln market too. Thanks Millie. Thank you, Dinata. Markets like this are just what we need at this time of year. There’s such a joyful atmosphere amongat everyone as you walk round – both locals and visitors from some distance away. The German and Scandinavian stalls are my favourite – such wonderful, handcrafted goods. These pictures are beautiful! Thank you for sharing them. Looks like a wonderful place to visit during the Christmas market! These photos turned out great, I like that they’re taken after dark, it looks all lovely and lit up. ah, there is something more I can recommend, but I guess for summer (? ), check in browser “romantic route Germany” – plenty lovely towns and castles! Thank you for sharing these lovely photos, Millie. I’m glad you had a great time. Did you have roast chestnuts? I’m glad I posted the photos now. I almost didn’t bother. Yes, we always have roast chestnuts. We both love them and there are several stalls that sell them. There are a lot of hot foods on sale, and there are always queues at them. It’s such a carefree event and we really missed it in 2010 when it was cancelled because of the snow. It looks like a great event, and from what I’ve seen, Lincoln is a beautiful city too! Thank you, Andy! Lincoln is a lovely city, mostly because it’s small, as cities go (about the same size as Exeter, which you may well know). 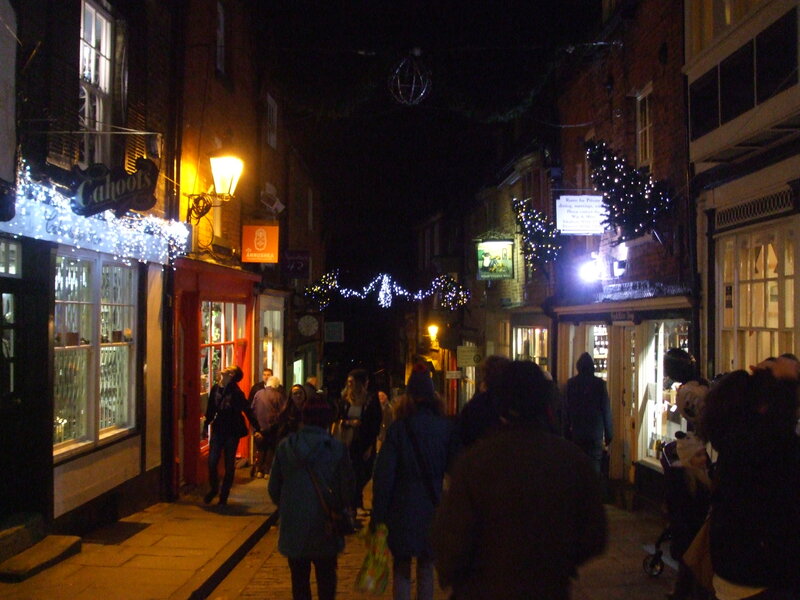 ‘Uphill’ Lincoln draws tourists all year round, especially around the cathedral and castle. Uphill was where the Romans had their fort, Lindum, too, so there are Roman gateways and other fragments of ruins there. This area is up on the Lincoln Ridge. The steep slope dividing upper and lower Lincoln was formed by the River Witham cutting its way through the ridge. (Oolitic limestone/oolite … lovely stuff!). I love the names of the different parts of Lincoln, albeit a little unimaginative! Lol! That’s very true about taking places for granted. My parents house, (and my old bedroom window), overlooks St Michaels Mount, and that just seems a normal sort of thing. I’ve only once been up to the castle, and only a few times been over to the Mount itself – we just tend to take it for granted! Well, there are all kinds of villages in Lincolnshire. Some are of local stone, others are mostly brick-built. Lincolnshire as a whole is a very rural county – very little work for young people apart from on the land or in the towns, of course. It’s very flat, too, apart from the Lincoln Ridge and the Lincoln Wolds. There are some lovely villages in the Wolds – more expensive houses, needless to say. Your parents’ house is in a wonderful place! We intend to get out to St. Michael’s Mount next time we’re in Cornwall. The Wolds has always fascinated me, but I’ve never really looked into why they are so much higher than the rest of Lincolnshire, I assume they too are composed of Jurassic rocks. It’s funny where we all end up. Look at you, up in Scotland! Cornwall is a lovely county, but do is Fife. I’m sure you’re very happy there. As far as I recall, the Lincolnshire Wolds are a mixture of chalks, limestones and sandstones (Cretaceous) as well as glacial deposits here and there. It’s a SSSI, though, and very pretty. We have thought of moving there – along with a million other places! Of course, now you say it, I think I may have read about the Wolds being Cretaceous (Greensands amongst the chalk etc). Hopefully for you Millie, you won’t be visiting St Ives during the summer holidays, it’s a nightmare that time of the year because it gets so busy!! I can imagine. It was November the last time I went to St.Ives, and there were plenty of people around then. (We were living in Crediton in Devon at the time). It might be outside of the school holidays, though. We haven’t got dates for any holidays next year yet. It is very close to Dartmoor. It’s lovely around there. And we had a few days going into Cornwall, too. I love the red sandstone cliffs on the coast aroud Bude. Anyway, I was going to ask, did you see the floods they had at Boscastle about 12 years ago? We had been to Boscastle not long before those floods happened. Then, a couple of years later, they were used as case studies in geography books, so I ended up teaching about them, too. As for the red sandstone at Bude, I do remember the wonderful folding. Awesome cliffs. I worked at Tempest Photos when those floods occurred. I used to drive one of the minibuses, which I then had the use of outside work hours. I’d parked in the car park the week before the flood, if it had been a week later, the Tempest owners would have seen one of their buses floating out to sea! Lol! I know that sounds almost sick, but the Tempests weren’t exactly the best employers for how they paid their workers ( whilst I was there, Mrs Tempest was the 64th richest woman in the UK) and when the minimum wage was brought in, almost a third of the workforce got over a 50% pay increase!!! Sorry, I got somewhat sidetracked!!! You can sidetrack as much as you like, Andy – I do it often enough. It’s all very interesting. It seems to me that really rich people are the same everywhere: no thoughts at all for the peasants – or, should I say ‘plebs’? Lol. On a serious note though, you were very fortunate not to have been on Boscastle a week later. I might have been you as well as your minibus floating out to sea! I know that very few lives were actually lost in that flood, thanks mostly to the effectiveness of rescue operations, I believe. The damage to the place was severe, as I recall from videos we had at school. Floods are Britain’s No. 1 natural hazard, but aren’t we fortunate not to have severe earthquakes and such like? I’d like to visit that area again, and of course go up to Tintagel. Lol!! It’s a hard life being a peasant! 🙂 Most importantly, I’m a happy peasant, and I’d much rather that, than to be an unhappy Lord of the Manor!!! It’s good in one respect that we don’t have any serious natural hazards ie so people aren’t coming to too much harm………….but from a personal aspect, I wish we did have real weather extremes, earthquakes and volcanic eruptions. I find the power of nature absolutely fascinating!! I was gutted that I had missed the Boscastle flood!!! But as I said, I don’t like all the suffering that goes with such things. I’m a happy peasant, too. Who needs money? 😀 As for natural hazards, I’m happy to study them – cause, effect and repsonse. I agree, that aspect of them is fascinating, and I’m impressed with methods of predicting volcanic eruptions. I just hope one day they’ll be able to predict earthquakes as well. I’m not nearly as interested in meteorological hazards as I am in tectonic omes. But the whole subject of how the earth works is amazing. Thank you. That is much appreciated, Andy. What a beautiful market! Just looking a your pics adds to the Christmas spirit over here on the other side of the Atlantic! 😉 I wish European Christmas Markets would catch on in the States… it seems like such a lovely way to do some holiday shopping as a family. So much nicer than going to a mall! Thank you, Jean. You know us Brits… we revel in the traditions of the past. The way the stall-holders dress in Victorian costumes adds to the ‘olde worlde’ feel. These markets are a lot of fun. We’re hoping to get to the one in Cologne next year. It’s the biggest Christmas market in Germany, and I’d love to see it – as well as a few others over there. I’m sure your shopping areas are very festive, too. I’m sure I read somewhere that some places in the U.S. were setting up Christmas markets. Millie, how lovely! I really like the festive market atmosphere shopping much more than the prefabricated mall department store shopping that is available to me. The German influence is quite interesting. We actually have a fair amount of Germans who live in our city here as a result of the air force base. They are very active in the community, some have opened restaurants and they hold a traditional Mayfest celebration also every year. Millie we do have several craft fairs where they may do this as the Air Force Base here actually puts a grand one on..The thing is that I don’t go to the craft shows so I don’t know if the Germans have anything set up or not. I may have to check it out next year. I know that one well, I have a tremendous sweet tooth! Thanks, I always enjoy a good break, likewise I hope you have a fantastic holiday season. Pics look great to me. Always harder to take in the dark. Love the photos, and I can see quite well the markets. There is a special atmosphere at the xmas markets and the cold isn’t enough to dissuade folk from attending. It must be a nice chance to get out and meet old and new friends. Merry Christmas, Millie. In 2011, I went on a Christmas markets tour of Germany, Switzerland and Austria. It was fantastic and I did go to the Heidelberg market too. Very cold there but the gluhwein warmed me up. Heidelberg sounds really lovely, but I think I’d like to do that in the summer. Like you, we’re considering a markets tour, but probably just the German ones. I’m sure you had a wonderful time! Thanks for that, Amanda.